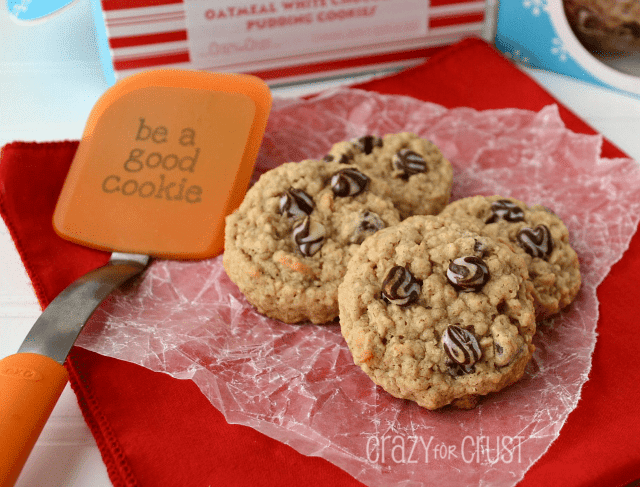 Need a fun lunchbox cookie? 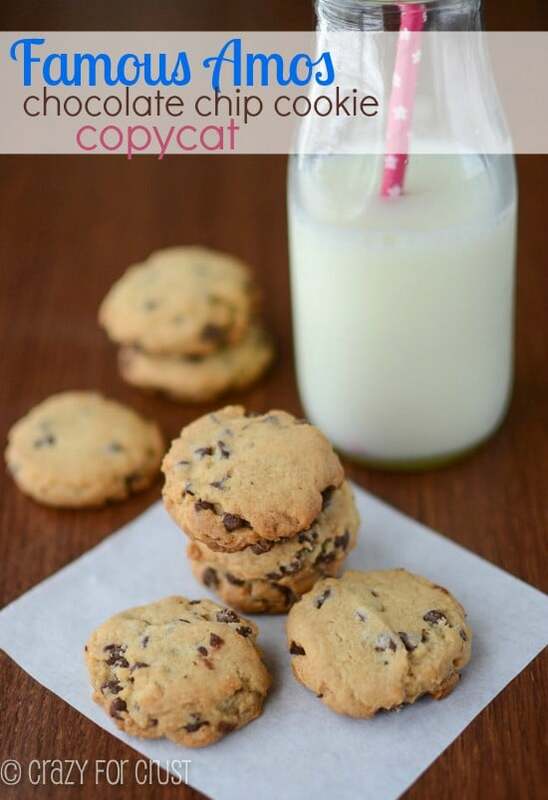 These Famous Amos Copycat Chocolate Chip Cookies are perfect for after lunch, or anytime! In college, I took night classes. For some reason computer science classes were required for a math major (um, I hate computers, thankyouverymuch) and most of the computer science classes were at night. So, I’d go to school in the morning, go to work, then come back to school at 6:00 for three fun hours of methods, CSS, and other things I’ll never remember. Since I was rushing from work, I never really had time for dinner. My dinner came out of a vending machine near the student lounge, and usually consisted of a Coke and a bag of Famous Amos Cookies. Ever since I can remember, I’ve loved those cookies. Even in high school, whenever I brought money for lunch, I’d buy a bag of them. Or two, because there were only 5 cookies in a vending machine bag and 5 mini cookies is not a serving. 10 or 20 is a serving. I still love those cookies. I don’t buy them anymore (you can only find large bags at the grocery store, and if I buy a large bag, I’ll eat it all in one sitting) and just mentioning the name makes my taste reflexes remember the flavor. So, in honor of back to school week, I thought I’d make my own. A Famous Amos Copycat! Now, normally I love big, gooey, soft chocolate chip cookies. As a general rule, I want my cookies almost raw in the middle. BUT…these cookies aren’t that.They’re small and crunchy. But they’re supposed to be! It’s what makes them amazing. Normally I don’t use Crisco. I use butter, because butter is better. I like the flavor of butter, and even though I’ve always said there is nothing wrong with Crisco…it scares me a little. Like…what is it? You don’t have to chill it! You can whip up this dough and bake it right away. 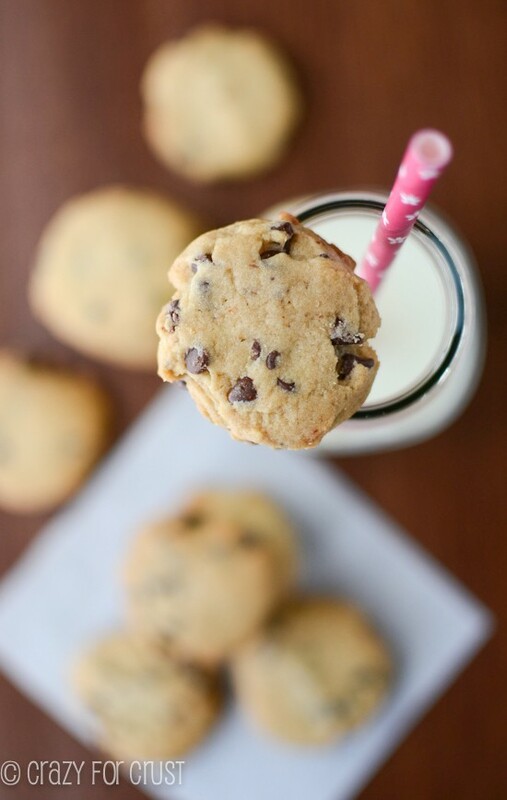 So if you want cookies NOW, not tomorrow, make this recipe. 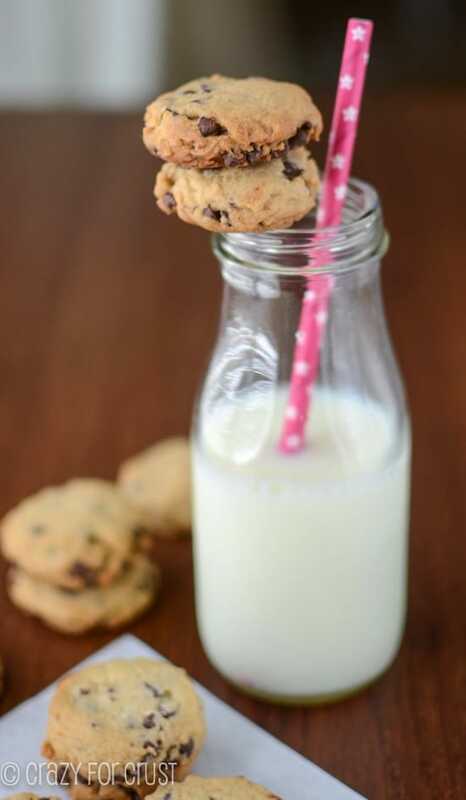 These cookies are perfect for a lunchbox treat. I am a firm believer in a sweet treat after lunch, but it needs to be small. 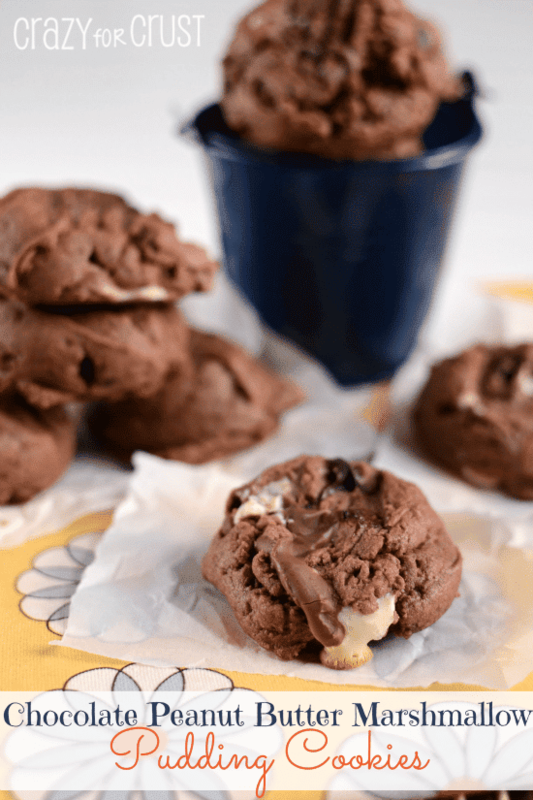 One Kiss or a couple M&Ms…or one little Famous Amos Copycat cookie! Or, you know. You could eat these after lunch when you work from home. Not that I’d know about that. These also taste sort of like those other mini chocolate chip cookies, the ones that come in the bag in the cookie aisle. Having just had those this past weekend, however, I can say that these are 100% better. 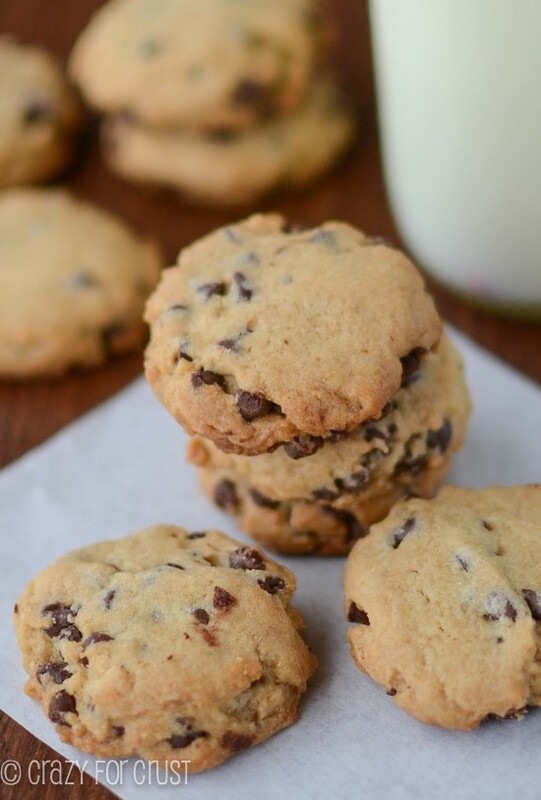 So, if you’re in the mood for a small, crunchy cookie, make these. And remember all those vending machine days! I certainly did! Plus, this recipe makes a ton. Freeze them for all month! Preheat the oven to 350 degrees. Line cookie sheets with parchment paper or silpat baking mats. Cream butter, shortening, and sugars together in an electric mixer fitted with a paddle attachment. Beat in egg, vanilla, and milk. Beat in salt and baking soda. Stir in flour and mix until combined. Stir in chocolate chips. Scoop 1 tablespoon balls of dough (I use a small cookie scoop for this) and place onto cookie sheets. Press the dough lightly with the palm of your hand to flatten just a bit (about half the thickness of the ball). Bake for about 13 minutes, until the cookies are slightly browned. Remove from oven. Cool 5 minutes on cookie sheet before removing to rack to cool completely. They will get crunchier as they cool. So my dad has this obsession with wanting to have a Famous Amos inspired Chocolate Chipless Cookie , it still tastes like a chocolate chip cookie but just without all the million pieces of chocolate morsels in it. So my question is: if I remove the morales would it still have the same taste as a Famous Amos cookie? I’ve tried different recipes and they all just taste like overly sugared cookies. I’ve made these cookies, the taste really good. May I know the nutrition behind of these cookies and about the calories? Because I’m planning on a diet and tend to have these cookies during my diet? I don’t have shortening what can I substitute with?